Korea's world's-first 5G mobile phone service has gotten off to a rocky start at best, with some users complaining that it was at times even slower than their LTE connection. The average speed of the LTE connection by Korea's three main mobile providers was 150 Mbps late last year and 177 Mbps in Seoul, but 5G connection speeds fluctuated widely from one spot to another. 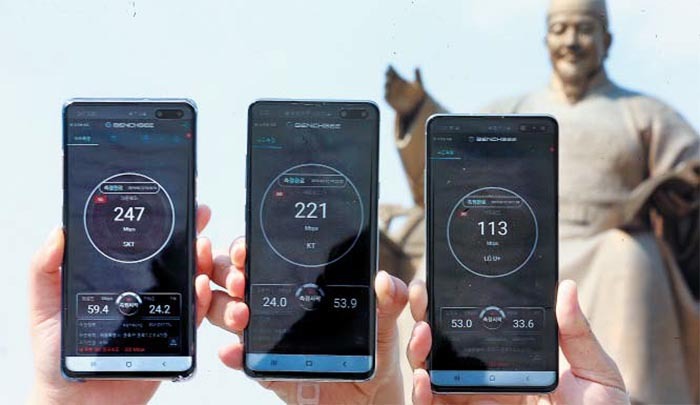 At 2 p.m. on April 4, KT's 5G service quality in front of the King Sejong statue in Gwanghwamun, downtown Seoul got as fast as 590 Mbps. But at the same spot a week later it was a glacial 113 Mbps for LG Uplus, 221 Mbps for KT and 247 Mbps for SK Telecom. The first week, a 2GB movie or mobile game could be downloaded in 30 to 45 seconds, but that slowed to 65 to 130 seconds a week later. It seems the 5G service is unable to cope with even the small numbers who have access to it. "The number of 5G users rose to around 150,000 over a week, and there were a lot of them in downtown Seoul over the weekend," an industry insider said. Data transmission speeds are displayed on 5G-enabled smartphones sold by Korea's three mobile providers in Gwanghwamun, Seoul on Friday. Telecoms hope to boost the number of 5G base stations from around 80,000 at present to some 240,000 by the end of this year. "Base stations need to be added in 85 cities, because focusing them in particular areas of the country will lead to complaints of discrimination," the insider said. "If we secure 240,000 base stations by the end of the year, we should be able to cover around 80 percent of 5G data traffic." They will also be installed in subway stations and office buildings. Korea hastily launched the world's first 5G mobile phone service on April 4, about two hours earlier than the U.S.' Verizon, which tried to steal a march on Korea by bringing its own launch forward by a week. Meanwhile, U.S. President Donald Trump vowed to win the 5G race. "We cannot allow any other country to outcompete the United States in this powerful industry of the future," he said Friday. "The race to 5G is a race that we must win."